This private villa wedding ceremony and reception décor was destined to become an instant classic. With all the chic gold accents, modern geometric details and natural wood elements, this custom collection recently made a perfect feature in Style Me Pretty! 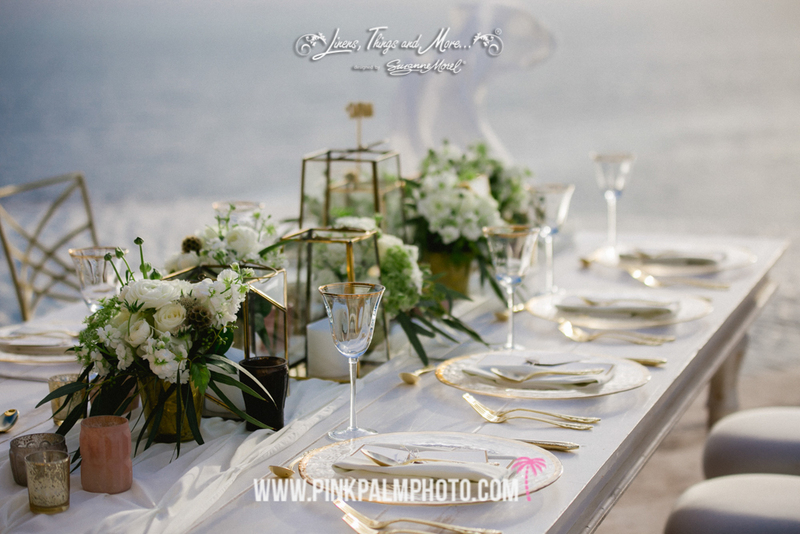 This couple wanted to capture a very specific feeling with their décor design, so we combined some classic, elegant pieces with a few organic details to create this stunning look for Alexandra and Chris’ wedding day in Los Cabos. Our gold and white chameleon chairs were an important aspect of this ceremony set-up. 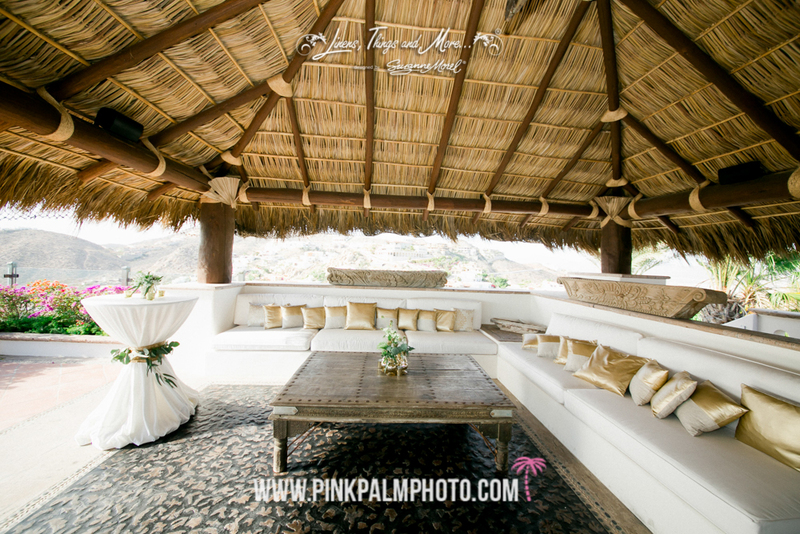 They created an elegant seating area without distracting from the amazing cliffside views! Best of all, they also tied everything together at the reception, where each place setting featured a gold-rimmed charger and gold flatware. The gold details carried over to the centerpieces, where gold votives, metallic vases and geometric lanterns mixed perfectly with the organic white and green florals. Our white chiffon table runner added the right touch of elegance while staying true to the natural look of the distressed white wooden table. We feel delighted to have been a part of this intimate celebration for Alexandra and Chris. Their chic gold and white organic décor collection will most certainly remain a favorite of ours for years to come! 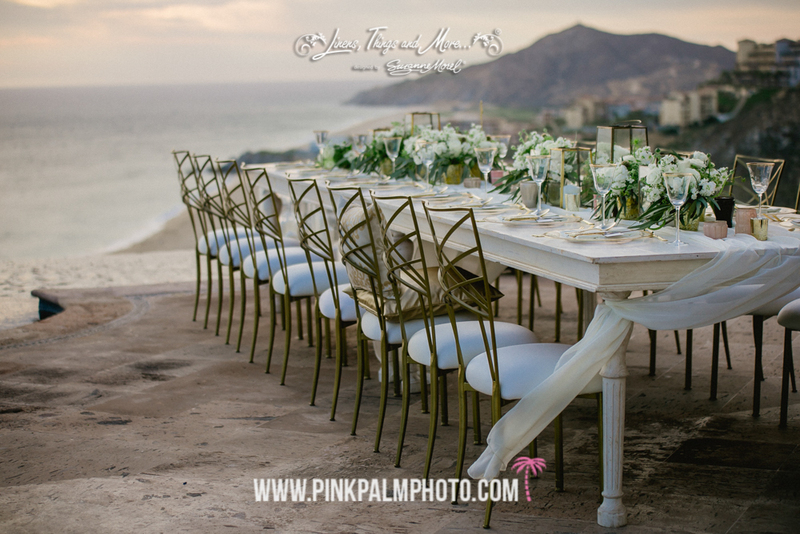 This entry was posted in Creative Destination Event Company, wedding locations in Los Cabos, Weddings and corporate events decor and tagged beach, DECOR, DESTINATION WEDDING, destination wedding Cabo, great view wedding, LOS CABOS, off white color, RENTAL COMPANY, villa wedding, WEDDING. 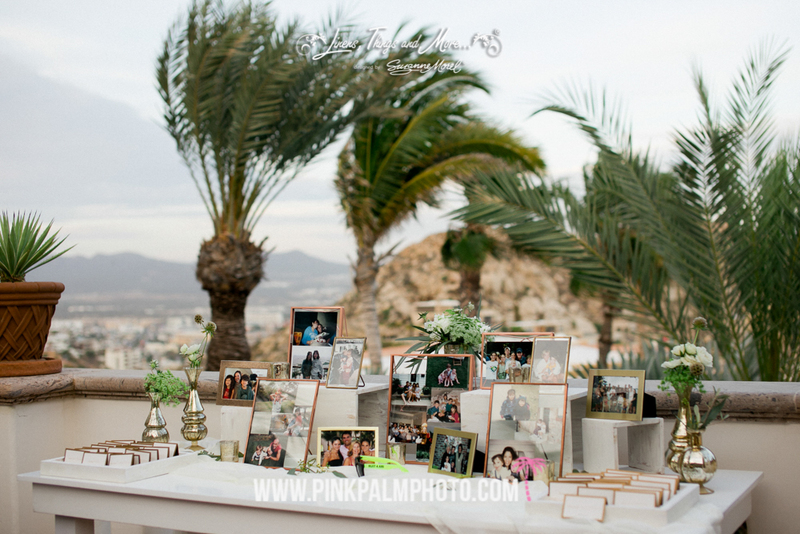 Dorothy and Anthony – Villa Bellissima, Pedregal, July – 2016.